With the Hall Coefficient Calculator, you can easily compute the Hall coefficient. The Hall coefficient unveils the nature of the charge carriers in conductors. If you are wondering what is the Hall effect and what is the Hall coefficient formula, you can learn all of it from the text below. If we apply a voltage difference to a wire, the electric current will start to flow. The charge carriers responsible for electric current will move along straight lines accelerated by the electric field until they collide with each other. After the collision, they will be again accelerated resulting in an effective velocity, called the drift velocity, directed along the wire. Instead of a thin wire, we can imagine a flat, sandwich-like piece of a conductor. Now, besides applying the voltage difference, we place it also in the magnetic field. The magnetic field is in the direction perpendicular to the flat conductor. Due to the Lorentz force, the paths of charge carriers curve resulting in an accumulation of charge carriers on one side of the conductor. This accumulation leads to a voltage difference V across the conductor. The appearance of the voltage difference due to the magnetic field is the Hall effect. B [T] is the magnetic field. q [C] is the charge of a single carrier. The Hall effect is important because it allows to find out the sign of the charge carriers. For example, with Hall effect, we can demonstrate that in some semiconductors the current is carried by positively charged holes, and not by electrons. 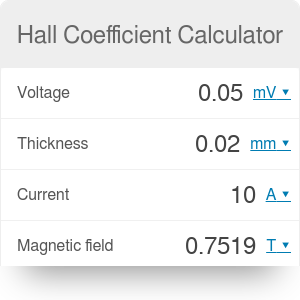 With the Hall coefficient calculator, you can quickly compute the Hall coefficient. You can also get other quantity from the Hall coefficient formula if you know the Hall coefficient. For example, the Hall effect is sometimes used to measure the magnetic field. It is simple to measure the voltage difference V with a voltmeter and the current I with an ammeter. If we know the Hall coefficient, we can then easily find the magnetic field. For example, the Hall coefficient of copper is RH = 0.133 mm³/C. Say we have a copper plate of thickness t = 0.02 mm. If we run through it a current of I = 10 A and observe a voltage difference V = 0.05 mV we would get that that the magnetic field is B = 0.7519 T.
Hall Coefficient Calculator can be embedded on your website to enrich the content you wrote and make it easier for your visitors to understand your message.